writes non-fiction and poetry. She teaches at the University of Wisconsin-Madison, where she specialises in environmental humanities, and she also keeps bees. She is the author Where Honeybees Thrive: Stories from the Field (2017), which won the 2017 Sigurd F Olson Nature Writing Award. Nearly every summer’s day, I visit honeybees. Some days, I sit and watch them floating in and out the hive. Other days, I pry off the hive cover to see them building their gorgeous wax home, packing the pollen and nectar they have gathered into the comb, touching each other with their tiny antennae. I know to approach them with respect. But recently, I went to the hives without my usual reverence. The air was thick and hot, typical of an August day in the midwestern United States. Another storm was approaching, and honeybees don’t like storms. I knew they were a bit on edge, yet foolishly, selfishly, I went into the hive anyway. I opened it to take some honey and was not very polite about it. The bees took deep offence. 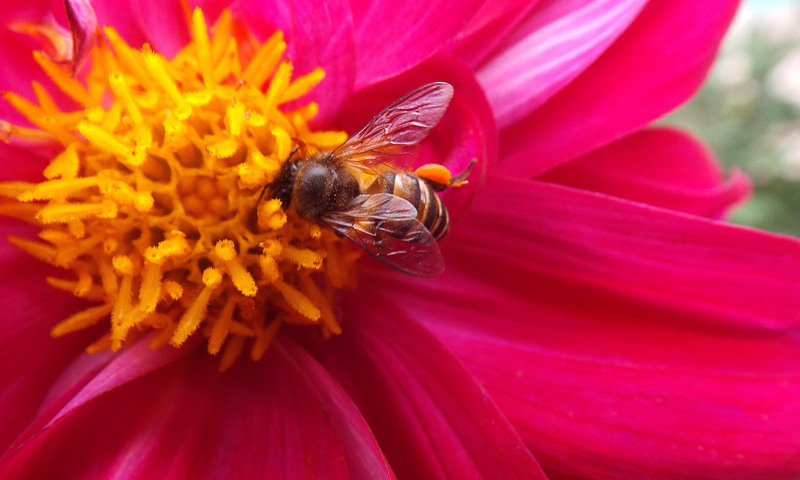 A honeybee does not sting unless she absolutely has to – when the hive is being invaded – because she will die if she does. Her stinger is covered with barbs, and gets torn from her body when it lodges in human skin, pumping bee venom until it’s removed. As soon as I took off the top box and began to pull one frame of honey from its edge, I was stung by two bees, and then a few more. Immediately, I knew I was in the wrong. The pain from the stings became intense, but I couldn’t leave the hive open because I’d made them vulnerable, so I stayed to put things back together. The stinging continued. Eventually I ran to the house, getting stung the whole time. They had gotten inside my veil and were caught in my curly hair. I react pretty strongly to one bee sting. A sting on my hand, and it blows up like a baseball glove, the pain lasting for several days. On this morning, I was stung up and down my arms, my back, on my neck, my legs, my stomach, my scalp. When I finally made it inside, I held my head under the shower, my body quaking as adrenaline coursed through. I had goosebumps everywhere. The stings quickly blossomed into welts: the physical pain was intense, but the emotional pain was so much worse. I felt horrible for killing so many bees, and was deeply ashamed. What would I learn from this pain? In part, it had to do with mindfulness. For years, I have practised mindfulness. This pursuit has taken me to Nepal and elsewhere, to spend time with monastics of many traditions and study poetry. In my early 20s, I stayed at a Zen centre in California. We rose in silence at 3:30am, donned long black robes, and walked along the moonlit paths to the zendo, or meditation hall. It was cold and smelled of nag champa incense. Wooden benches lined the walls where monks and practitioners sat on black zafu cushions for zazen, a meditation practice that emphasises breath and posture, and holds the promise of deep awareness. I sat up straight and tucked my feet under my thighs to keep them warm. I tried to train my eyes on the floor, as expected, but I always found myself busily thinking and looking up at the other monks. Their bald heads and folded hands… their serious faces. What was happening for them, I always wondered. The meditation bowl rang three times to begin the session, and the jikijitsu, or directing monk, walked quietly back and forth in the centre of the room with a short stick over his shoulder. If a student seemed to be slouching or falling asleep, he bowed before whacking them smartly on the shoulder with the stick to bring them back into the present. Luckily, I was never struck, but I always thought I should have been. After sitting in meditation for 45 minutes, we bowed and filed out into the early dawn. This is where I was most present. Light and wind came through the pines. Sometimes, the voice of an owl or a coyote echoed down the mountain. Here we practised walking meditation. Our long line of black robes swished in quiet rhythm. I was never able to keep my eyes on the ground, and found myself gazing at the branches against the indigo sky, or the monks’ dark figures snaking through the trees. I was aware of the many nonhuman beings around: listening to the breathing of the forest, the birds slowly waking. It was a kind of rapture, but still, it was probably not what the monks were experiencing. I loved that space: it allowed me to listen to the forest, to be smaller and quieter inside it. It was this teaching that helped me later with honeybees. After 20 minutes of walking meditation, we moved on to chanting. I had no idea what the sounds meant. I read along and did the best I could, but mostly I just loved the sound of the voices droning on together. Only later did I realise how similar they sounded to honeybees. During my time at the centre, I had no idea if I was doing any of it right. I did feel I was staying present, though perhaps it was not the being present that the monks prescribed. And I wasn’t progressing at all at koan practice. On arrival at the Zen centre, you were a given a koan, a little riddle to use as a mantra for meditation. Every day, you’d go to the roshi or teacher to give him an answer. I failed every time. Again, it was a practice that introduced me to ideas I now find useful when spending time with honeybees. With honeybees, you must enter their space with stillness, respect and active listening or they will sting you into awareness, like a jikijitsu. And when you visit the hive without fear or greed and become fully present, the bees begin to trust you; then you are invited into their world, which is one of care and beauty. They live a life of profound generosity. When they take from the landscape, they are actually giving back at the same moment. They take care of their community. The next day, when I went to the hive to apologise, the honeybees seemed completely at ease with me again. One sweet bee buzzed right up onto my hand, and stayed there calmly, as if to welcome me back.